On February 11, 2015, the House Education and Workforce Committee marked up the Student Success Act (H.R. 5). 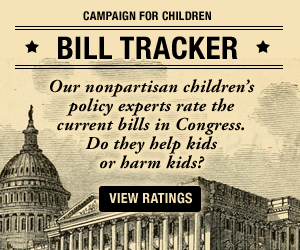 This legislation, sponsored by Representative Kline, would reauthorize the Elementary and Secondary Education Act (ESEA). 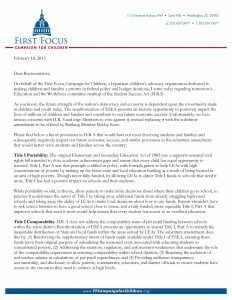 First Focus Campaign for Children sent this letter regarding the markup, highlighting the opportunity that reauthorization of ESEA presents to positively impact the lives of millions of children and families and contribute to our future economic success. It also highlights FFCC’s serious concerns with H.R. 5 and how Representative Bobby Scott’s substitution amendment would better serve students and families across the country.